Nissan’s former boss, accused of understating his pay, could see out the year behind bars, a local paper says – without being charged. His harsh treatment widens the gulf between Paris and Tokyo, making a deal on future ties between the Japanese carmaker and Renault even tougher. 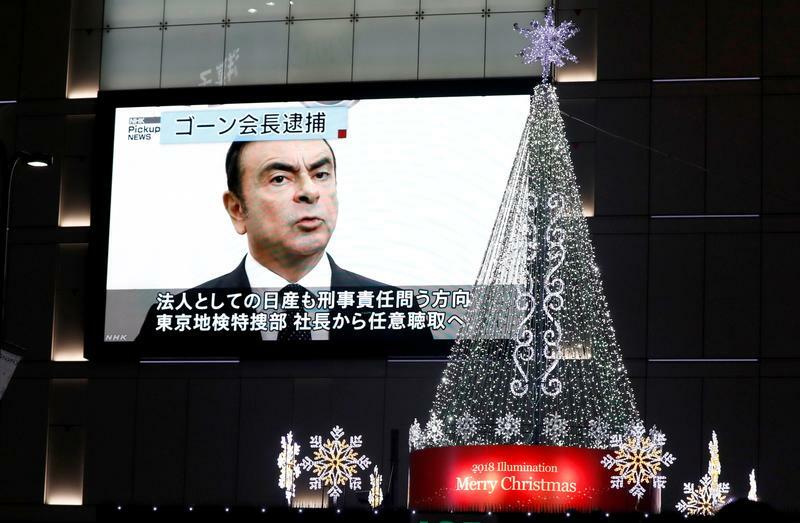 A street monitor showing a news report about arrest of Nissan Chairman Carlos Ghosn is seen next to Christmas illuminations in Tokyo, Japan November 21, 2018. Tokyo prosecutors plan to re-arrest Nissan’s former chairman Carlos Ghosn on a fresh claim that he misreported his income, the Sankei newspaper reported on Dec. 4, a move that could keep Ghosn in detention until the end of the year. Ghosn has been held by prosecutors in Tokyo since Nov. 19, when he was detained on suspicion of conspiring with former Nissan Representative Director Greg Kelly to understate his compensation by about half of the actual 10 billion yen ($88 million), over five years from 2010. Sankei said the new arrest would relate to the same crime, from 2015 to 2017. Ghosn has been unable to respond to the allegations, which public broadcaster NHK says he has denied. In Japan, suspects can be kept in custody for 10 days. Judges can allow for extensions of another 10 days on prosecutor request. At the end of that period, a formal charge must be lodged, or the suspect is released. However, they can be re-arrested for separate crimes.